Batman panther cape 6 or 8 panels? Discussion in 'DC Costumes and Props' started by GF, Dec 9, 2010. I'm making my own panther cape, does anyone know if it's a 6 or 8 panels cape? I believe the Panther is 6. Really? I'd like to know your source. It was 8 panel 100% sure. I had always heard that the cape had the same pattern used from '89 thru B&R. I've seen shots of a clooney panther that is definitely 8. My advice is don't use 6 panels unless you want to never have it hang in front of you. Unless maybe I'm completely wrong but I have built 2 Panther suits in the past and they each used 6 panels. I had an 8 panel Artsee at one point and it wrapped around too far. I used that for my Returns style. Then again, maybe it all depends on the width of the panels? 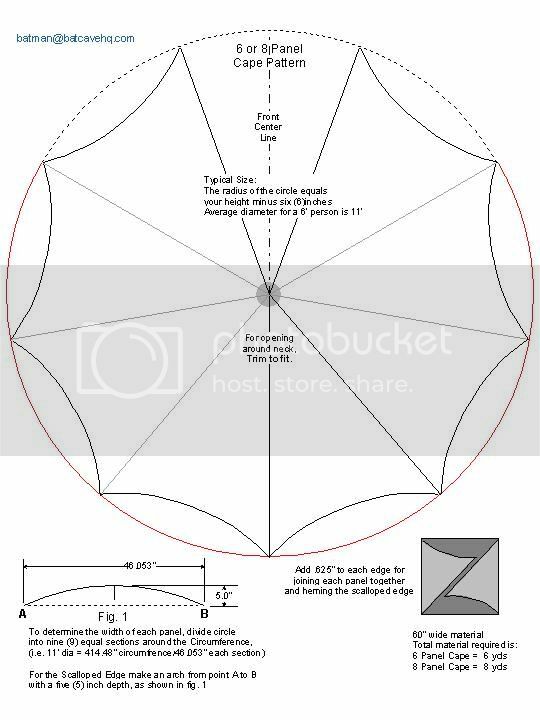 That's the exact pattern I'm working with, but before I start cutting my material I need to know 100% if it's 6 or 8 panels, according to the pattern posted above the width of the panels are 46"
how wide did you make panels? Honestly, I never made any of my capes. Mine were all made by other folks. The last thing I ever want to do is tell anyone something that is not completely accurate but again I was under the impression through all of my research that 6 panels were utilized for Forever and B&R since the cowl was shaped differently around the front and did not drape around fully as seen in 89 and Returns. If you read the archives on the BOTB or even inquire from some of those that sell the cape you'll find it's an 8 panel cape. Went through this when I build my Panther already, that pattern is not correct for a Panther is is for a 89 or Returns though. I PM'd you, would love to know the Panther dimensions. I own a copy of the real 89 cape and that pattern you found off the BOTB is a little off. Also to add to the conversation the Panther cape is nearly identical to the 89/Returns few changes to the front panels where the cape meets the cowl and a little longer. As for panel it does have 8 . The B&R cape and Sonar cape has 10. Below is a pic of a screen used panther sold off screen used. As you can see the cape did wrap around the front, however in the movie it is usually tucked over the shoulders. Hope that helps.